The legendary John Surtees occupies a unique place in the history of motor racing. He not only won seven motorcycle world titles between 1956 and 1960, he also switched to four wheels and went on to claim a further crown in the Formula 1 World Championship. When MV approached him at the end of the 1955 season, young 21-year-old Surtees, who was born into a well-to-do family of motorcycle enthusiasts in Catford, had already won 77 races, mainly with Norton 350s and 500s. Inventor of a new style that was challenged and that is at the roots of todays riding technique with the body outstretched towards the inside of the curve, he won another six titles in the 350 and 500 classes between 1958 and 1960. Of course they were easy years for MV due to the fact that the leading rivals pulled out. But we have to remember that Big John, as he was called, really ran wild, shattering records previously set on racetracks throughout Europe on a regular basis. In 1959, Surtees' results were even more spectacular, he triumphed in all the races in both 350cc and 500cc classes. A year later, he won both classes again, prevailing in five out of his six 500cc races. By the end of 1960, Surtees had scored an amazing 38 GP victories on two wheels. In 1961 he turned to the world of automobile racing, entering the annals of history as the only rider who was ever able to win the world championship title with both motorcycles and cars. Indeed, he won the 1964 F1 title with Ferrari. Following his long car-racing interlude - first as a driver and then as a builder and engineer - today he has returned to his first love by willingly entering revival races, still fast and a great stylist. Surtees displayed the same passion, skill and professionalism in F1 as he had shown in motorcycle racing. He moved to the Ferarri team in 1963, after first learning the ropes at Lotus and Parnell. It was a smart move, as he was soon rewarded withhis first GP win at the Nurburgring. Just one year later, he was crowned the F1 World Champion. After spending much of 1965 recovering from a major crash, he then left Ferarri midway through 1966. He was apparently fed up with the team's manager, Eugenio Dragoni and the internal politics of the Italians. In 1969, he became an F1 constructor with his friend, Mike Hailwood. However, the marque never enjoyed the racing success of either of its founders and was closed in 1978. Surtees then went on to become a property and a respected wroter. In 1979, he returned to the Isle of Man to the scene of his first victory and rode an exhibition lap. He scored more then 350 vitories on both 2 and 4 wheels in a diversity of races. (350cc, 500cc, F2, F5000, F1, CanAm). 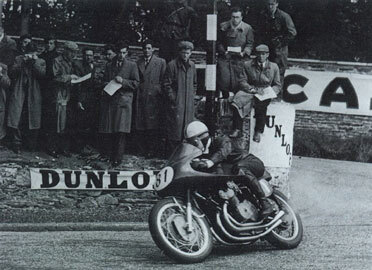 1949 - Started racing riding a Vincent Grey Flash. He developed it while he was doing his engeneering apprentiship with the Vincent HRD Company.